While now it seems there is a 100-mile race almost every weekend, not too long ago there were just five 100-mile races in the United States. There were the two original races, Old Dominion and Western States, and then two other Grand Slam of Ultrarunning races started shortly thereafter, the Leadville Trail 100 and the Wasatch Front 100. A year after the Slam was established, a fifth upstart race emerged in the San Gabriel Mountains outside Los Angeles, California, the Angeles Crest 100. This weekend, for the 28th time, the AC100 will be held with over 180 runners attempting the arduous journey from Wrightwood to Altadena. Angeles Crest has remained true to its roots over the past three decades as it has no lottery, very few sponsors, and a classic old-school vibe. Directed by Hal Winton and Ken Hamada for over 20 years, the AC100 has a strong sense of identity and an endearing resistance to change. As it was my first 100-mile race back in 2000, Angeles Crest will always hold a special place in my heart. For years the race was held in late September or early October and served as the final race in the Last Great Race Series. In recent years, however, in an attempt to avoid the fall fire season in Southern California, the race has been held in early August, placing it smack dab in the middle of the Last Great Race Series. Over the past decade the women’s course record has been broken several times most recently last year by Oregonian Pam Smith. Yet, amazingly, the men’s record has clearly stood the test of time as Jim O’Brien’s extraordinary time of 17:35 has been the standard since 1989. Many runners have taken a shot at Jim’s record with none even getting within an hour of it. Who knows, maybe this year will be the year? The Angeles Crest course, as well, has remained largely unchanged over the years. Running for much of the race in an east-to-west direction, paralleling the Angeles Crest Highway, the AC100 is wonderfully ‘crew friendly.’ Only an occasional small re-route due to environmental issues has changed this classic, mountainous, point-to-point course in the last few years. That and the finish are the only material changes in nearly three decades of racing. This week’s Beer of the Week comes from Taproom favorite SweetWater Brewing Company. 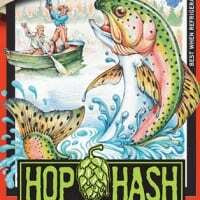 The other day I finally got my hands on their Hop Hash Double IPA and it was outstanding. Much milder and more drinkable than many other DIPAs, it was quite lovely at the end of a long, hot summer day. Have you run the AC100 or are you running it this year? If so, what aspects of the race’s course, community, and history do you really like? I am hoping to get up there tomorrow. Amazing race in my backyard. Waaaay back In 1990, the HURT (Hawaii Ultra Running Team) gang ran Angeles (AC) after not getting into Western States. We figured all our training shouldn't go to waste… and how hard could a little LA run to the Rose Bowl be anyway? Ha! It was plenty hard… but it was plenty enjoyable too. We ran as a group (we called it a peloton because we changed the lead runner every 15 minutes). We chanted "HURT… HURT… HURT" into every aid station as we went. We were ridiculed for sacrificing our pace to that of our slowest member… but we were happy. An Elvira (the mistress of the night) look-alike greeted us at one memorable aid station and got hugs from all of us. All for one and one for all… until around 70 miles, after which it was more like where's that dang Rose Bowl? It was old school for sure. I am glad it still is! Thanks Hal and company! What do people recommend between 2? I would be after trail running in beautiful scenery, minimal road running and good for a family. If those are your criteria and those are the only two races you're considering, I'd vote for AC100. Worse for your crew, but possibly some of the best scenery, EVER, would be FatDog (120m) in Canada. 120m on almost all single track, point to point through three provincial parks, extremely well marked course, great organization, aid stations, etc… Not that I'm biased or anything, but THAT race was frickin' outstanding. Go for AC. Leadville has become a corporate circus, with the qualification for starting being able to breathe. 700+ runners on an out-and-back single track on Hope Pass is a mess, with runners going down having to yield to all the runners going up, and some missing the cutoff at Winfield. And then there is the disgusting muling (pacer carrying all the runner's gear) that all runners can use. Disgusting run. Leadville any day, colorado is super cool,It is a great race and Leadville is super cool. AC 100 could be great but my self leaving in South California will never race in the summer, too hot. I think if you are looking for heat just run Badwater :-) I think AC would be a super run in early spring but definitely not in the summer. I agree. There's nothing less 'old school' than racing to see who can load a webpage the fastest and having loads of people who want to do your run be unable to. If you want to resist change, let me just call you up the night before and let you know I want to run. If that doesn't work, well, you changed, so you might as well do it in a way consistent with the best interest of the runners and the run. Amen, Deanger! Is it really so hard to do? One change that wasn't resisted was the solo runner concept – giving preferential registration access to those running without crew or pacers. I'm curious to see how this works out. Great way to cut down on cars (a real problem for this run in recent additions) and promote a self-sufficient mystique that seems in fitting with the flavor of this event. But we shouldn't forget that pacers are supposed to be there for safety, so there could be a cost in theory. I saw some staggering around coming down middle Sam Merrill that did not look safe, and of course there's the nighttime thing.